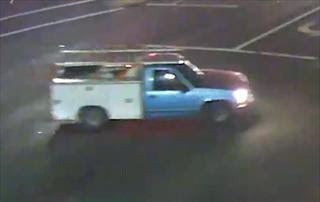 Sacramento Police released pictures today of a vehicle suspected to be involved in a hit and run accident that killed a bicyclist last night. On Wednesday, March 15, 2017 at approximately 9:25 p.m., the Sacramento Police Department responded to Marysville Boulevard and Los Robles Boulevard regarding a collision involving a vehicle and a bicyclist. Responding officers located an unresponsive male bicyclist laying near the roadway with injuries consistent from being struck by a vehicle. The Sacramento Fire Department responded to the scene and pronounced the bicyclist deceased. The involved vehicle failed to stop after the collision and fled north on Marysville Boulevard. 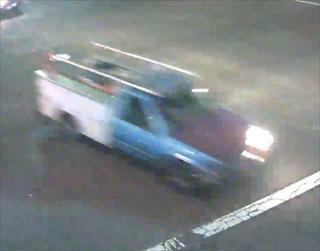 The vehicle is described as a blue full-sized work truck with a white utility bed, toolboxes, a rack and may have damage to the right front headlight. See photos above. The victim’s identity will be released by the Sacramento County Coroner’s Office. If you have any information regarding this collision, please contact the Sacramento Police Department via the Hit-and-Run Tip line at (916) 808-6030, dispatch center at (916) 264-5471, or Sacramento Valley Crime Stoppers at (916) 443-HELP (4357) or submit an anonymous tip using the free “P3 Tips” smartphone app. Callers can remain anonymous and may be eligible for a reward of up to $1,000.